Driving in fog can be dangerous. 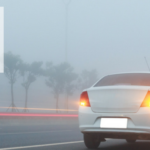 These tips will help keep you and your passengers safe when driving in fog. Tips for driving in fog. Driving in foggy conditions can be really eery. Especially if you're caught on an unfamiliar Country road or seemingly deserted high street. These Tips for driving in fog will help you stay safe.